John Morgan and Finney were colleagues at Oberlin College and both embraced the doctrine of perfectionism. After graduating valedictorian from Williams College in 1826, Morgan became an instructor in Latin at Lane Theological School in Cincinnati, Ohio. During his time at Lane, the students formed an antislavery society. Morgan was the sole faculty member to support the student movement. The trustees of the school—some of them slave-owners—were appalled at the student’s actions. In spite of opposition from the school’s president, Lyman Beecher, and from benefactors Arthur and Lewis Tappan, the trustees took action against the society. Among their actions were the banning of all extra-curricular student societies and the dismissal of John Morgan. The students, infuriated by this response, withdrew from Lane. Soon afterward, John Jay Shipherd met with these students to persuade them to enroll at a new school he hoped to establish at Oberlin. The students agreed to come if several conditions were met; among them: John Morgan must be given a professorship. Shipherd agreed to all the student’s demands. Morgan accepted the invitation and in June 1835 began teaching New Testament exegesis and literature. 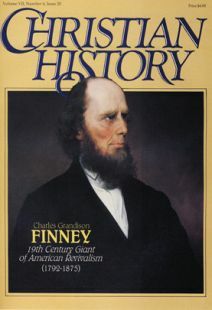 At the same time Charles Finney became Oberlin’s professor of theology. In the fall of 1836, several of the faculty members, including Morgan and Finney, began to stress the doctrine of perfection. Many prominent Christian leaders severely criticized Oberlin’s position. Morgan answered these attacks in the Oberlin Quarterly Review. Throughout his 32 years at Oberlin, John Morgan, a versatile scholar, taught in every branch of the school. He corresponded with the traveling Finney several times seeking to influence him to return to his responsibilities at Oberlin. Secondly, based upon his interpretation of Romans 7, Noyes believed that at conversion all sin was cleansed from the believer; therefore, believers could reach a state of perfection in this life. Because of Finney’s increased interest in perfectionism, Noyes—who was receiving much public attention—hoped to include the famous evangelist in his cause. Finney wrote to Noyes, “I have often heard of you and your extravagances . . . I have learned not to be frightened if it is rumored that anyone has received any light which I have not myself.” After a meeting, Noyes was pleased that Finney did not consider him insane. However, Finney changed his assessment of Noyes and his ideas. Followers of Noyes were often inclined to fanaticism. Then, in 1843, Noyes declared himself to be filled with the Holy Spirit and therefore entirely sinless. The result of his declaration was expulsion from Yale, alienation from professors and friends, and rejection by his sweetheart, Abigail Merwin. Though discouraged, Noyes persevered, and in 1841 organized his followers into the Society of Inquiry, a utopian commune in Putney, Vermont. The goal was to usher in the Kingdom of God; among the means to accomplish this were: biblical communism, “theocratic democracy,” divine healing, male continence (sexual discipline) and complex marriage—whereby all members were married to each other. Six years after its inception, the Putney group proclaimed that the millennial kingdom had come to their community—they had achieved perfection. The outside world concluded otherwise, however, and amidst angry charges of adultery the members of Putney were forced to remove to another community at Oneida, New York. The Oneida community reached its peak membership in 1857 at 250 people. Though only an average of less than two children were born per year at Oneida in its first 20 years, in 1869 Noyes oversaw a large voluntary experiment in selective human breeding to create a perfect spiritual generation. Public outcry forced the Oneida group—including Noyes’ nine offspring—to disband in 1881. Noyes removed to Canada. Oneida, grown affluent from planned selection of wealthy members and animal trap and luggage manufacturing, was the longest-lived and most radical American communal experiment. Charles met Lydia Andrews in 1820 during his legal training in Adams, NY. Lydia realized that Charles was not a Christian and began praying for his conversion. In 1821, he was converted. On October 5, 1824, Charles and Lydia were married. Three days after their wedding Charles left Lydia with her parents and traveled to Evans Mills, NY, to find a house. However, on the way he became involved in several revival meetings. He returned for Lydia six months later. Lydia, though, did not always stay at home; she and their children traveled extensively with the itinerant Charles. She did not enjoy public duties or speaking and preferred to work behind the scenes. During Charles’ revivals, Lydia would conduct women’s prayer meetings; Charles viewed these as essential to his revivals. Lydia was also instrumental in the formation of many infant schools and maternal associations in the towns where revivals were held. At Oberlin College, Lydia actively participated in the women’s department. She was viewed by many students as a “mother confessor” and a spiritual advisor, instructing the female students in educational, spiritual, and vocational matters. Lydia was described as reserved and humble. Her spiritual life was marked by highs and lows. She struggled with a poor self-image, depression, and nervousness. Yet she is noted for her achievements in forming women’s networks to promote missions, and activism in the antislavery movement. She became a new model for minister’s wives. On 17 December 1847 Lydia died, leaving five children: Helen, Charles, Frederic, Julia, and Delia. Her death has been called Charles Finney’s darkest hour. Elizabeth Atkinson, who became Charles’ second wife on Nov. 13, 1848, was a woman of strong character and great influence in her husband’s ministry. When they married she was a widow of 49 and Charles was 56. They had known each other for 18 years, but the details surrounding their marriage are not known. Like Charles’ first wife Lydia, Elizabeth was directly involved in her husband’s work. Unlike Lydia, Elizabeth enjoyed opportunities to work and speak publicly. She was confident, poised, witty in speech, and had an iron resolve. She also held prayer meetings, and addressed the gatherings as well as leading them. Finney’s revivals became known as The Finneys’ revivals. Elizabeth recruited women to help in the campaigns. Charles referred to her meetings as “one of the most important instrumentalities in the promotion of a revival.” One of her major achievements was elevating public tolerance for women’s participation in ministry, and she and Charles popularized the concept of team ministry. The public recognized her labors by its monetary support of her work. Elizabeth, confident that God was calling them to England, took on the entire Oberlin community. Charles eventually did go to England, but Elizabeth’s popularity waned at Oberlin. In the incident Charles seemed to show indecisiveness and dependence upon Elizabeth’s judgement . . . or respect for his wife by following her feeling of calling to England. The second trip to England was the crowning event of the Finney’s ministry. The success of the trip endorsed Elizabeth’s ministry among women, and helped her regain respect in the Oberlin community. After returning from England in 1860, the Finneys continued their labors at Oberlin. In 1861 Charles, 68, suffered a collapse from stress and exhaustion. While Elizabeth was nursing him back to health, her own health failed. She died on 27 November 1863 while on a trip to Clifton, NY. Finney’s third marriage was to the widowed Rebecca Rayl in the fall of 1865. She taught at Oberlin and was an assistant principal in the female department. Charles was 73, she was 41. Rebecca was a strong-minded and independent woman. While Charles would preach against the evils of frivolous adornment, Rebecca would sit listening in a blossom-adorned bonnet. She was articulate in speech and skilled as a writer. In Charles’ final years, as his strength to preach was failing him, he began to do more writing. During this period of his life, Finney devoted himself to attacking the Masonic movement. Rebecca assisted regularly in his writing endeavors. Tutor, opponent, and friend, Rev. George Washington Gale was Finney’s pastor in Adams, NY. Charles was choir director at Gale’s Adams Street Presbyterian Church. Friends though they were, they disagreed about theology. Gale, a past student of Princeton, preached a Calvinism that Finney would not accept. Charles stated in his Memoirs that in discussions he “criticized [Gale’s] sermons unmercifully.” Their discussions ultimately resulted in Finney’s conversion. Gale became Finney’s sponsor and ministerial instructor. Because of poor health, Gale left the pastorate in Adams and settled on a farm in Oneida County, NY. He began a practical education experiment, offering a home and teaching to young men preparing for the ministry in return for farm work; his work became the Oneida Institute. Later he and his followers traveled West and founded Knox Manual Labor College in Galesburg, IL (named for him) where Gale taught moral philosophy. After Gale’s recommendation of Finney as his pastoral replacement was rejected in Adams. he recommended he be commissioned in Jefferson County, NY. Finney’s first marked success as a revivalist came when he preached in the Whitesboro Church during a stay at the Gale farm. As Finney progressed in his ministry, Gale criticized his crude preaching style and confused theology, openly voicing embarrassment of his convert and former student. Finally, however, Gale softened on Finney’s approach and became involved in the revivals. A famous clergyman Lyman Beecher was a minister of churches in Long Island, NY, Litchfield, CT, and Boston, MA, and a leader in the so-called Second Great Awakening and the New Divinity movement. He was also a leader in the early attack on Finney’s New Measures. Beecher considered Finney’s new-style revivalism dangerous. He charged that the revivals tended too much toward emotionalism and said they would lead to “barbarism.” He was displeased with Finney’s methods of allowing women to pray in mixed groups, being from a tradition where women who did such things compromised their femininity. He was the leading spokesman against Finney at the famous New Lebanon Conference in 1827, where, after it became evident that Beecher and his associates had been misinformed about various things, Finney was cleared of bad practices. It was seen as a victory for Finney, and a defeat for Beecher and even more for his associate Asahel Nettleton. Beecher claimed to have told Finney after the New Lebanon meeting that if Finney planned on bringing his revival to Boston, he would meet him at the Massachusetts border and fight him all the way there. Eventually, however, Beecher admitted the value of Finney’s campaigns, and corresponded and met with him on several occasions. Finney did bring his revival to Boston. Beecher and Finney maintained a cordial, but distanced relationship. Beecher was said to be the “father of more brains than any man in America,” for among his children were Harriet Beecher Stowe, writer of Uncle Tom’s Cabin, and Henry Ward Beecher, the most famous American preacher of his day. Beecher was tried and acquitted in the Presbyterian Church for heresy in the 1830s for his modified views of some central Calvinistic doctrines. At the time of Asahel Nettleton’s conversion in 1801, he was considering opening up a dancing school. Later, after graduating from Yale in 1809, he was involved in successful evangelistic work in eastern Connecticut and was ordained as an evangelist in Litchfield County, CT in 1817. He never held a settled pastorate and never married. Nettleton was a very astute and respected evangelist. He had an intellectual approach to preaching, like Jonathan Edwards, and was known for somber yet vivid, powerful sermons. He also had a highly developed approach to his meetings involving attention to maintaining a reverent, orderly atmosphere, careful coordination with local pastors, and a thorough visitation and follow-up instruction program for new converts. He was among Finney’s most severe critics and felt called to halt the influence of Finney and his unorthodox, innovative measures. With Lyman Beecher, he led the effort to clip Finney’s wings at the New Lebanon Conference, but seeing early on that the meetings were not headed for the results he wanted, he remained absent from most of the sessions, due to “nervousness,” returning on the last day noticeably irritated and suffering from dashed hopes. Nettleton campaigned against Finney in his sermons, letters, and other publications. When it became clear that Finney was surpassing him in popularity as an evangelist he became increasingly incensed. Lyman Beecher observed in 1827 that Nettleton was as far above Finney in his “talent, wisdom, and judgement, and experience,” as was Napoleon Bonaparte above any average corporal in the French army. However, Nettleton’s preaching fell out of favor with many of the more “progressive” ministers—Beecher included—because he persisted in emphasizingoriginal sin, a doctrine Beecher and his kindred spirits dropped in their revision of Calvinism. Beecher eventually accommodated Finney more and more, but Nettleton never compromised his position, becoming in this and other matters an opponent of Beecher. Nettleton never fully recovered from a bout with Typhus fever he contracted during his ministry and died in 1844, his significant work publicly eclipsed by the meteoric career of the man whose influence he opposed. Arthur and Lewis Tappan were the primary financial backers of Charles Finney and other social reformers. Wealthy New York merchants, they were active in the “Great Eight Benevolent Societies,” which included the American Bible School Union and the American Temperance Society. The Tappans also strongly supported the antislavery movement, and through their support, kept Oberlin secure through its controversial involvement with the abolitionist movement. The Tappan brothers had become wealthy as silk importers and merchants. (Arthur Tappan and Company at times grossed over $1 million annually.) The Tappans also founded America’s first credit-rating agency, which later became Dun and Bradstreet. Lewis Tappan was instrumental in influencing Finney’s acceptance of the pastorate at Chatham Street Chapel in New York City. Chatham Street Chapel was called the “cathedral of benevolence.” The Tappans insisted that blacks be invited to the chapel and Finney did not object. Yet, throughout Finney’s career there, blacks were segregated from whites. This policy eventually led Lewis to leave the church; he wanted color distinction abolished. A disastrous fire in 1835 began a series of financial difficulties for the Tappans. In 1837 Arthur Tappan announced, to the shock of the public, that he was $1.1 million in debt. During this crisis, Arthur’s concern for financial responsibility toward his creditors won him great respect in the financial community. Arthur Tappan was the first president of the American anti-slavery society, and later president of the American and Foreign Slave Society. Lewis Tappan was a delegate to the World Antislavery Convention in London in 1843; he retired in 1849 and devoted his time to humanitarian work—primarily for the antislavery cause. When angry students abandoned Lane Seminary because of their stand against slavery and decided to be part of the new school at Oberlin, they chose Asa Mahan as their first president. Mahan as a Lane trustee, had been a defender of the students’ position. He became Oberlin’s first president—a unique school where black students would be invited to join the student body, and complete freedom of speech would be allowed on all reform issues. Asa Mahan and Charles Finney brought attention—and scorn—to Oberlin by their perfectionist teachings. Mahan, in 1836, was the first of the two to receive the second blessing. He later recounted, “ ... The highway of holiness was now, for the first time rendered perfectly distinct to my mind." When Mahan had related to Finney the experience of being "baptized in the Holy Ghost,” Finney sought and later, in 1843, found the blessing for himself. In 1836, Mahan and Finney held revival meetings at Oberlin, in which Mahan did most of the preaching. At the last of these meetings a student asked if “we may look to [Christ] to be sanctified wholly, or not?” Mahan recalled that he was shocked at the question, for he then realized the implications for the first time of his perfectionist teaching. At this point he and Finney cautiously responded that further thought would have to be given to this question. In 1839, when a student asked a similar question, Mahan’s immediate response was “yes.” Mahan and Finney came out forcefully on the side of Christian Perfection. However, when news of Mahan’s attitude at Oberlin had circulated, and he approached some Oberlin supporters for money, support for his new school dried up and the enterprise died. After Mahan left Oberlin, the school distanced itself from its past radicalism and was apologetic about its previous perfectionist extremism. Oberlin elected as its next president the famous and more controlled Charles Finney. Mahan, who championed perfectionism to the end (and acted somewhat less than an achiever of it), later served two other colleges as president, and was a pastor for some time in Jackson, Michigan. He was all along regarded for his skills as a speaker and writer. He spent his last years in England, where he died in 1889.